Free Shipping Included! 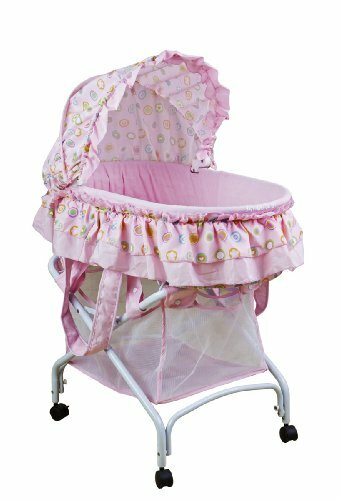 Dream On Me Layla 2 in 1 Bassinet to Cradle, Pink by Dream On Me at Baby Stroller Car Seat Combo. MPN: 440-A. Hurry! Limited time offer. Offer valid only while supplies last. Dream On Me Layla, 2 in 1 Bassinet to Cradle is a great alternative for newborns when you want them comfortable and close by while they sleep. Dream On Me Layla, 2 in 1 Bassinet to Cradle is a great alternative for newborns when you want them comfortable and close by while they sleep. Completely portable, the combo is great as a By-the-Bed Sleeper with its large storage basket for baby's essentials as well as a take along portable bed. The safety hooded locking wheels allow easy movement from room to room. This transforming bassinet features a fully adjustable frame and two rocking legs on each end of the bassinet, located just above the wheels. Simply release the spring loaded latch on both ends of the bassinet and swing arms 180 degrees and latch into place. Your bassinet is now a cradle. The removable portable bed comes with extra long handles (slings), mattress pad for comfort, removable canopy plus washable bedding. Recommended for newborns up to 18-20LBS.